Large coal fired power station in Kentucky builds two industrial stacks with PennguardTM lined steel flues for FGD wet stack service. The East Kentucky Power Cooperative (EKPC) produces electricity for 16 regional power cooperatives, which between them serve one million consumers in 89 counties. The Spurlock Power Station near Maysville, Kentucky is EKPC’s largest power station. Spurlock station has recently completed two wet limestone flue gas desulphurization (FGD) systems, each with a new, PennguardTM lined industrial stack. The two FGD systems were fitted to the 325 MW Unit 1 (in service since 1977) and the 525 MW Unit 2 (in service since 1981). Both are conventional coal fired units, using coal with a sulphur content of 3.5 % – 4.2 %. The two FGD’s will remove some 98 % of the sulphur oxides from the exhaust gas flows of Units 1 and 2. In addition to Units 1 and 2, the Spurlock station operates two 268 MW circulating fluidized bed (CFB) boilers, which are among the cleanest coal fired units in the United States. The addition of FGD systems to Units 1 and 2 presented EKPC with several options for the industrial stacks. Together with their consulting engineers, Stanley Consultants from Muscatine, Iowa, EKPC looked at the possibility of relining the existing Unit 2 industrial stack to make it suitable for carrying FGD treated, water saturated flue gas. It was found however, that the fast construction and commissioning schedule of the FGD retrofit project would not allow a sufficiently long outage to achieve this. Following a technical and economical investigation of all options, EKPC decided to award to Karrena International LLC the design and construction of two, 198 m high concrete industrial stacks, each with a single, PennguardTM lined steel flue. 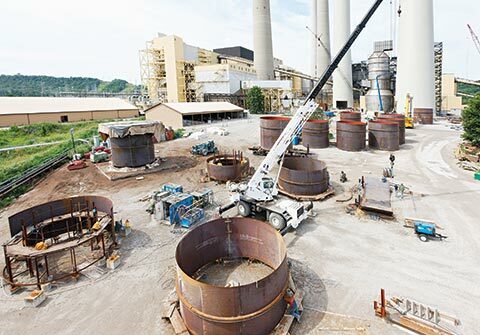 After considering the jobsite layout, the project time schedule and the weather conditions in Kentucky, Karrena International decided that they would build, grit blast and primer coat steel flue sections on ground level. Once a steel flue was erected by welding these sections together in the windshield, the PennguardTM lining was applied in the erected flue, using a movable work platform. To ensure the quality of the installed PennguardTM linings in the two Spurlock industrial stacks, a team of up to three Hadek Quality Assurance (QA) Inspectors was present on site during the surface preparation and lining installation process. 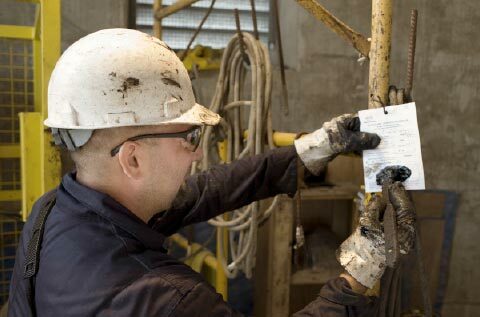 Between its offices in Rotterdam, the Netherlands and Pittsburgh, Pennsylvania, Hadek Protective Systems has a group of 14 Quality Assurance Inspectors who are trained to supervise the complete field installation process of a PennguardTM lining. These pages show some pictures of the process of constructing and lining the Spurlock steel chimney flues. The steel flue diameter of the Unit 1 industrial stack is 6.40 metres. 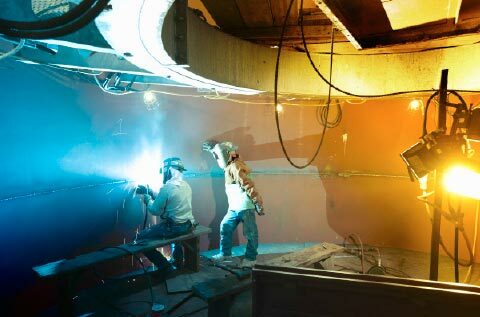 The Unit 2 steel flue is 8.24 metres in di­a­me­ter. Kar­re­na de­ci­ded to pre-fa­bri­ca­te steel flue sections on site, close to the new chim­neys. The grit blas­ting re­qui­red for the PennguardTM Block Li­ning Sys­tem, as well as the appli­ca­tion of PennguardTM Block Pri­mer, were also per­for­med on ground le­vel. Once grit blasted and pri­mer coa­ted, the steel flue sections were carried to the industrial stack with a mo­bi­le cra­ne. The sec­tions were then at­tached to the flue in the industrial stack by wel­ding from two sides. The welds were clea­ned with po­wer brushes and then hand pain­ted with PennguardTM Block Pri­mer. With flue erection complete, Karrena installed a full size suspended work platform to fa­ci­li­ta­te the in­stal­la­tion of the PennguardTM li­ning sys­tem. The plat­form accommodated a team of up to 10 in­stal­lers and sup­port wor­kers, who ap­plied the PennguardTM lining from the bot­tom to the top of each flue. A smaller, faster lift moving through a hatch in the cen­ter of the plat­form was used for trans­por­ta­tion of the installa­tion crew, their tools and the PennguardTM li­ning mate­ri­als. 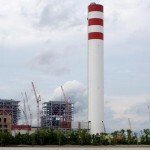 The lining of the 162 m tall Unit 1 flue took 45 days and the lining of the 165 m tall Unit 2 flue took 38 days. 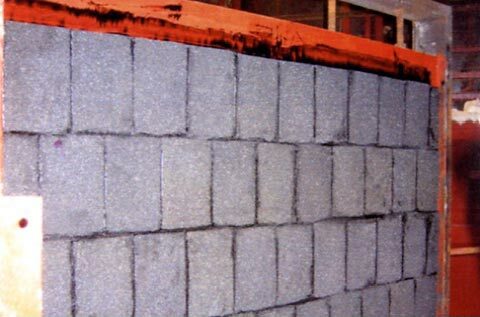 Mixing of the two component PennguardTM Adhesive Membrane is a critical step in the application process. For the Spurlock project, Karrena used two of Hadek’s proprietary, automated mixing machines. In order to track the quality of the mixing process on a pail-by-pail basis, the staff in charge of the mixing machines produce a small sample card for each pail. Hadek’s QA Inspectors will systematically check the curing of the adhesive on the cards, as a first confirmation that mixing has been successful. On the work plat­form, the instal­lers ap­ply the PennguardTM lining using a dou­ble buttering techni­que whi­le minimizing any air inclusion. The installers apply the adhesive back and side joints at the required 3 mm thickness. The ap­pli­ca­tion pro­cess is mo­ni­to­red by Ha­dek QA In­spec­tors, who also keep track of temperatu­re and hu­mi­di­ty at re­gu­lar intervals. The two steel flues in the Unit 1 and Unit 2 wet stacks have a combined surface of 8,130 m². 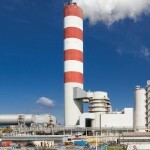 For any power station owner, fire is one of the more serious risks both during the construction of new plant and during operation and maintenance of existing equipment. FGD plants and the chimneys built directly next to FGD plants are no exception. Ever since the introduction of FGD, a number of large fires have occurred in FGD plants in North America, Europe and Asia. At Hadek’s request, the Thermal Sciences group of the Exponent engineering company have performed a study entitled “Performance of Different Chimney Flue Designs During Large Power Plant Fires”. 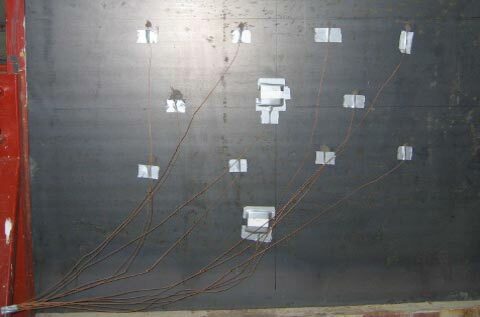 PennguardTM lined test wall before the ASTM E-119 test. Temperatures measured during the ASTM E-119 test. 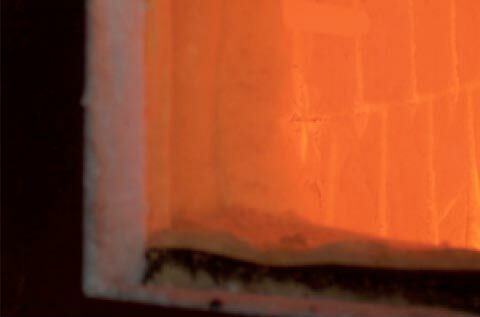 Exponent’s study report shows how PennguardTM lined steel chimney flues are effectively insulated from overheating, as they are filled with extremely hot smoke from an FGD or power plant fire. 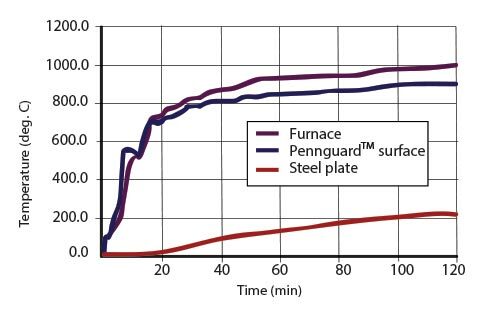 By comparison, steel flues without a PennguardTM lining or FRP flues are more likely to overheat, catch fire and collapse (study report is available on request). Exponent’s test work also included a fire propagation test, to see how a fire could escalate if the joints between PennguardTM Blocks are accidentally set on fire. The test showed that although the joint will catch fire, it will burn slowly and has a tendency to extinguish by itself after some minutes. 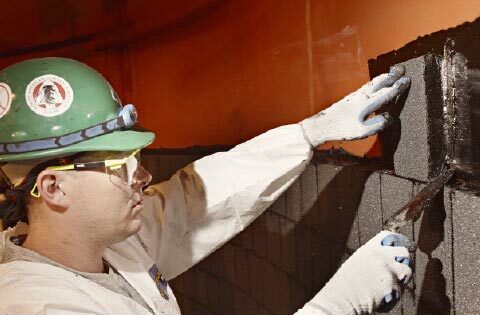 The Exponent study shows that although good fire safety practice still has to be followed during construction and operation, the use of PennguardTM lined chimney flues is a valuable, additional step in improving power plant fire safety. Thermocouples for monitoring of steel substrate temperature. 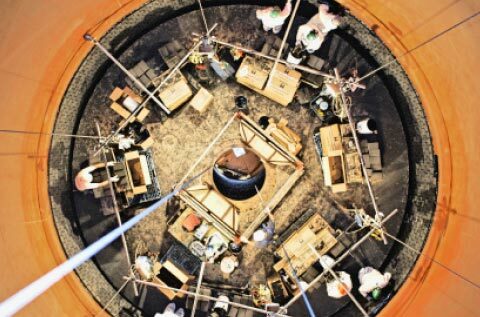 Inside of test chamber during the ASTM E-119 test.